So what's shakin? It's been a long kind of restless week so far here. Lots of photoshop sewing and some regular sewing.. and you know, waiting. My fabric should be here the beginning of next week.. you know the early bits before market. The rest will arrive sometime later, after it's long cruise. I've had some small projects to keep me busy. I am not sure why I even made that churn dash.. I was testing out a little idea.. but now I can't even think of what it was. I worked on a purse that did not work out as I had hoped. I need to take some time to explore interfacing options and find a store that caters to garment makers. The 'usual suspects' just aren't doing the trick for me. Something for Future Pam to worry about I guess. Tell me about your week! What's new? What's happening? Are you as excited about TV shows coming back? BLACKLIST! I love it! Did you try any new shows? I love TV and want to hear what you think. Nothing fun here. Off to work early each AM and this week I have been to tired to sew. Maybe tonight I will do another side on a long waiting binding project. 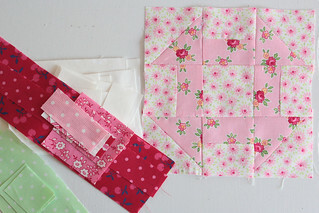 Looking forward to sewing your fabric! I just binge-watched the first season of Blacklist - then caught the first episode of Season 2 - I am hooked. Other than that - its time to straighten up my sewing room and purge some fabric - its always nice to see what I have lurking in my fabric piles. Last night we watched "Forever" a new weekly show with Jude Law. Nice eye candy. "Good Wife" is my all time favorite show. I'm working on a "Fancy Foxes" quilt. I love the little block. I recently watched the entire first season of Black List and so was excited for the new episode. It was kind of confusing...is it season two? At any rate, I accidentally knocked over a ufo box and now am dealing with suppression of the desire to finish each one when I already have tons of other stuff going. It must be so exciting to get your very own fabric you designed in your hands! What an accomplishment! And the cherry on top is that everyone absolutely loves your fabric design! How fun! I taped blacklist, just need focused time. What are you looking for for garments? Try Britex in SF. Have you tried Sew Lazy products for interfacing? I just finished watching season 1 of Blacklist on Netflix. Great show!! Such a gorgeous block! If it's 12" send it my way, the churn dash is going to be my sew bee block. Well, if it is 12 1/2 inches you can send it to Renee for her block this month!